When you book a trip, you probably look for the cheapest, most direct flights possible. Oh you don’t? Me either. As soon as I log onto various airline websites, my inner plane geek comes out. After the search results pop up, I’m quickly looking at flights and what they are equipped with. Yes, pricing definitely figures into the process, I’m not spending twice as much to fly exclusively on a CRJ200 from Bangor to Bangkok. As I’ve mentioned before, I’m 6’3″ tall and a wingspan bigger than that. My most important aspect is comfort. Sure, laugh it up, you’re not going to be comfortable on any type of aircraft unless it’s the Emirates Business Class. I realize that. However, I’m looking at different flights to see what they are equipped with. Both for comfort and for the “oh sweet a 737-900ER! I haven’t flown on one of those yet”. This is where I found myself in January while searching for flights to Tampa from Bangor. Initially I found a flight that went BGR>DTW> JFK>TPA. That included a 767 flight from DTW to JFK and a 717 from JFK to TPA. It wasn’t the cheapest but it was close. So I kept shopping and eventually prices went up and didn’t come back down. Other flights from Bangor jumped through the roof as well so I moved to flying from the Portland Jetport(PWM). Flights from Portland were priced at almost half of what they would have been from Bangor, which in prior years, hadn’t been the case. Upon entering search criteria, the results flowed in. Just about everything flowed through LaGuardia, Atlanta or Detroit for one stop, multiple stops varied with combinations of the 2. The ability to avoid LaGuardia was very appealing and with a 2 1/2 hour layover in Atlanta, even with a delay, we wouldn’t have 86 seconds to sprint 6 miles to the next gate. Deciding on this, I selected the flight itinerary which was equipped with a 757 from Atlanta to Tampa. I’m not going to gush over the awesomeness of the 757, I promise. As the return flights loaded, the first one on the list, Tampa to Atlanta, equipment? Boeing 737-900ER. WE’RE TAKING IT!!! My girlfriend, jumped for joy as well at the thought of flying on such a plane. Actually, she could’ve cared less. 737, A320, Dodge Caravan? They’re all the same to her. 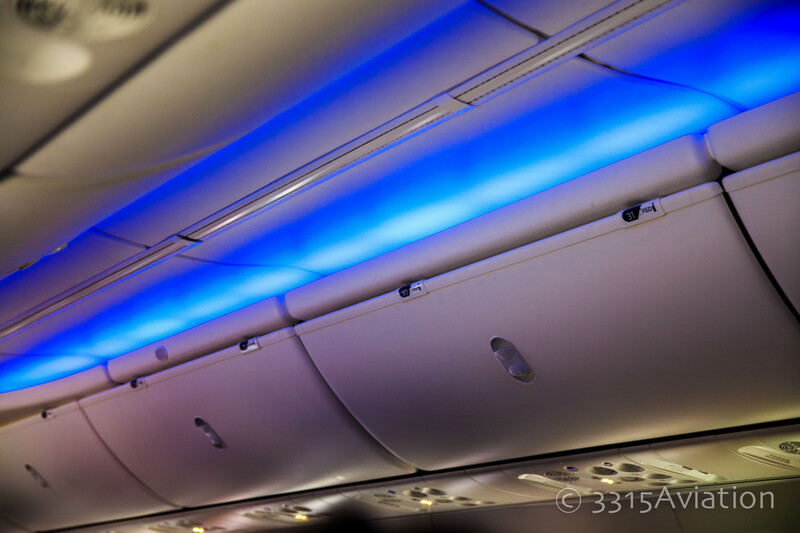 Mood lighting and overhead bins big enough for me to fit into. were the 4th and 5th passengers into coach, making our way to our seats, we didn’t need to fight for space in the overhead bins. However, this wouldn’t be a problem with the deep bins on the 900ER. My Think Tank Photo Airport Commuter camera bag fit easily in the overhead bin with more room to spare on top. After getting everything situated I sat down to get the GoPro setup to do a time lapse of the flight. It wasn’t until after I realized how much legroom I had. As I said before, I’m 6’3″ tall, weigh 265lbs and have wide shoulders. I don’t exactly fit comfortably in the shrinking aircraft seats. Using the tray table is usually out of the picture as my knees get in the way, or “that person” decides to recline and then it’s a great ride with aluminum hinges piercing my kneecaps. This time, I had plenty of room to put my feet under the seat, take the tray table from it’s upright and locked position to the unlock and un-upright position. And no hinges in the knees! 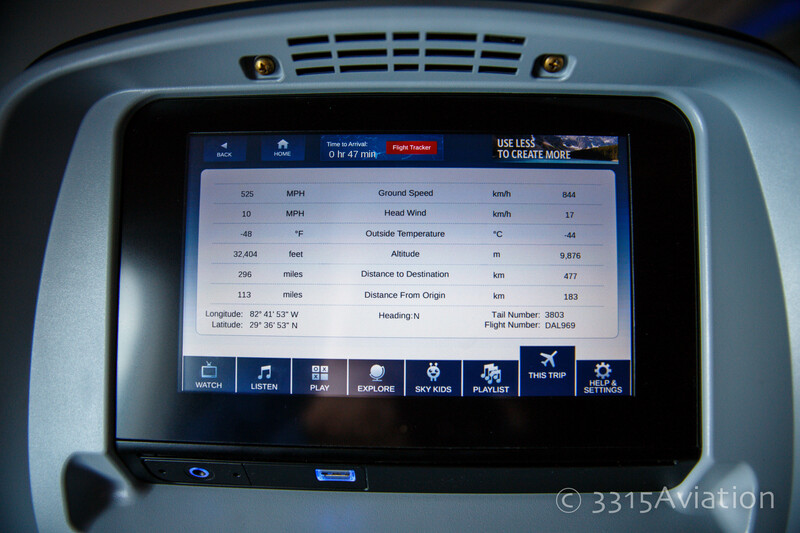 Aside from a couple Boeing 757-200s I had flown before, that had the in flight map, this was the first Delta flight I had been on that had personal in flight entertainment screens. Sadly this flight was only an hour and 15 minutes from Tampa to Atlanta so I wouldn’t be able to take full advantage of it. However it was great to be able to browse through the selection of movies, games and music and more. Obviously I kept it on the flight tracker screen, because, well, plane geek. Heading back from upper 80 degree temperatures in Florida to not even near 80 degree temperatures in Maine, the -48 degree outside temperature at FL 320 didn’t make me feel AS BAD about going home to mid 30 degree temperatures. In the screens at the lower left there was a USB plug and a headphone jack handy and ready for use. Also, in the seat in front of you, at just about shin level(for the 6’3″ variety anyway) there is a standard electrical jack. It is much easier to access than the one UNDER your seat on the American Air 737-800 I flew back in November. This was great as I was able to charge my phone and spare GoPro battery. 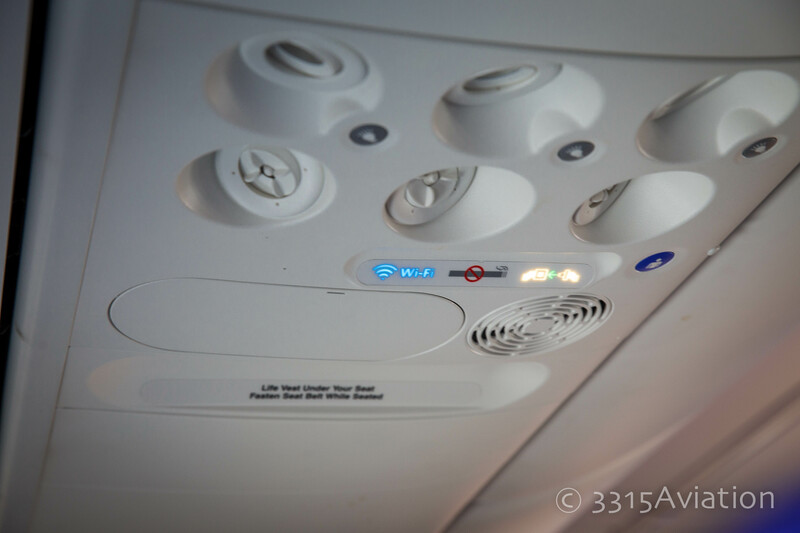 WIFI, reading lights and air vents. Overhead, the lighting has been upgraded from the early 80’s style lights and twist on and off air vents to more modern lighting and vents. And if you were wondering, yes, there is WIFI on board. The little lighted WIFI sign will remind you. My one question is, do we really need the no smoking sign on aircraft now? I realize there are some people that will try to light up a Marlboro and claim they didn’t see anything to tell them they couldn’t smoke. I get it, people are like that sometimes. Sadly this is what our society has become. Engine Noise. Or lack of. 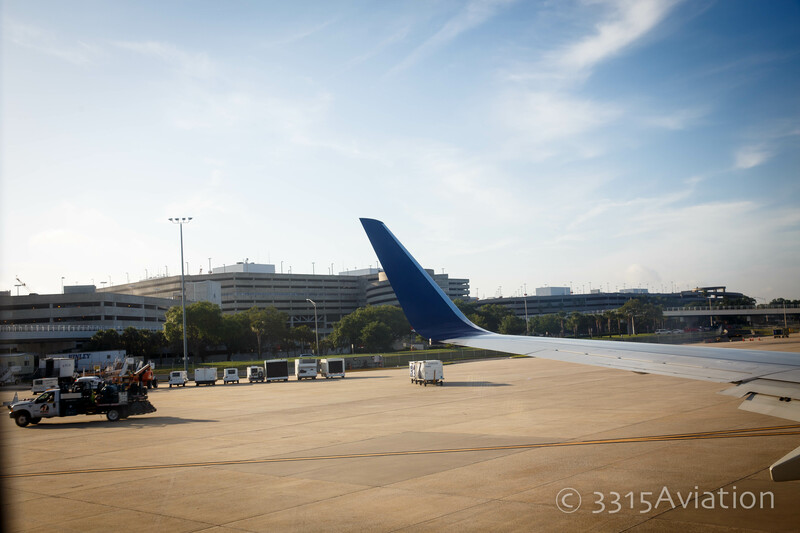 The winglets on the 737-900ER as we taxi from Tampa International Airport. The first leg of our trip from Portland was in a Mad Dog 88. Now I’m not saying the MD-88 is loud, but I’m just saying, when they fly over my house, I’m pretty sure a C-5 is quieter. I was very surprised at how quiet the twin CFM 56-7B turbofans are. Even at full thrust, rolling down 19R at Tampa, it was still very quiet. The 757 isn’t as loud as the MD-88 but then again I’ve never sat on the tail of one to find out how the rear mount engines sounds. Just judging it from the Allegiant Mad Dogs that fly over my house. My lovely girlfriend as we are deplaning in Atlanta. I’ll save you the semi-long drawn out explanation. This plane is fantastic. If you get the chance hen booking flights, opt for the flight with this equipment. For those with roll aboard bags, long legs, and/or wide shoulders, flying economy will be a pleasure. Seat pitch is on par with industry standards and while it isn’t First Class, it isn’t bad. The additional overhead compartment space is great, easily accessible and the mood lighting adds an extra touch to help keep your mind off the fact that you’re in a lightweight tube. The addition of the personal in flight entertainment screens is a huge plus. On long trips when you need to mix it up with your music, movies or tv, Delta offers a great variety with their selections. Let’s not forget to mention the Biscoff Cookies don’t hurt the experience either. With 39 in service and 61 more on order to be delivered between now and 2018, these will become more and more prevalent in mainline routes. Particularly those routes currently served by the 757-200. 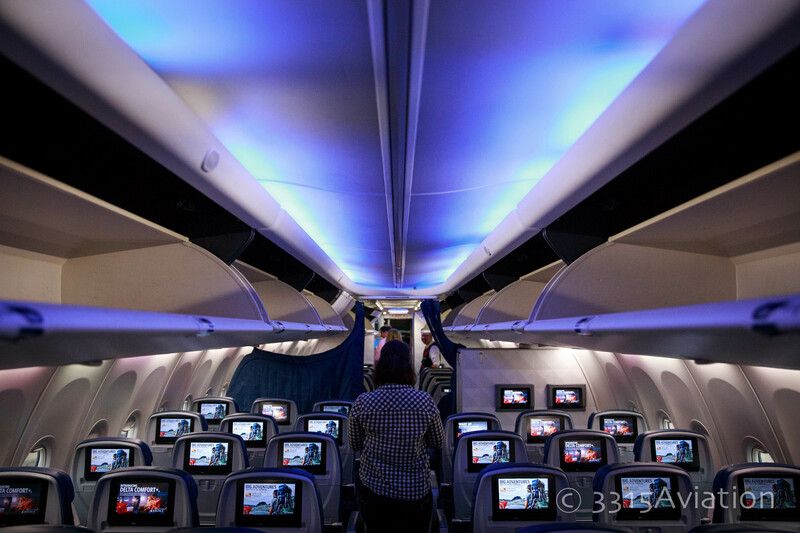 This is a beautiful plane, coupled with Delta’s top notch service and you’ve got a winning flight combination. Wheels up!